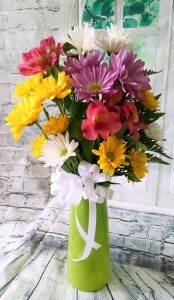 Color glass vase with beautiful fresh flowers. This gift is sure to put a big smile on someone's face. 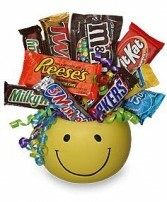 Smiley face mug filled with delicious candy bars. Add a balloon to make this gift even sweeter. 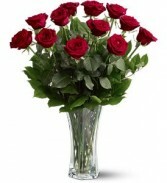 Dozen roses arranged in a vase with greens. 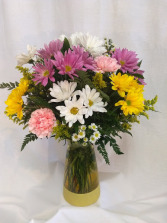 Deluxe includes filler flower.